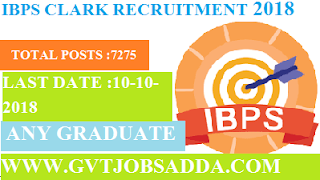 Institute of Banking Personnel Selection (IBPS) has recently published the recruitment of the Probationary Officer/ Management Trainee or in a similar post in that cadre,Those candidates who are interested in Institute of Banking Personnel Selection (IBPS) they can read official notification carefully and apply online before 04-09-2018, Brief information mention below. How To Apply : Candidates can apply online only from 18.09.2018 to 10.10.2018 and no other mode of application will be accepted. Educational Qualifications (As on 04.09.2018) : A Degree (Graduation) in any discipline from a University recognized by the Govt. Of India or any equivalent qualification recognized as such by the Central Government.